Make sure Python and Python SDK are installed on your computer. If it is not the case, see: Python SDK - Installation Guide. Start your favorite editor, let’s say IDLE, the one automatically installed with Python. Replace <IP of your robot> by the IP of your robot. If you don’t know its IP address, press its Chest button, NAO will say it. Save the file as a Python file. Your robot says “Hello, world!”. This line imports the module ALProxy. This line creates an object called tts. This object will send calls to NAOqi. IP and Port (9559) of the robot are also specified (it was not the case with Choregraphe). tts is the object we use. 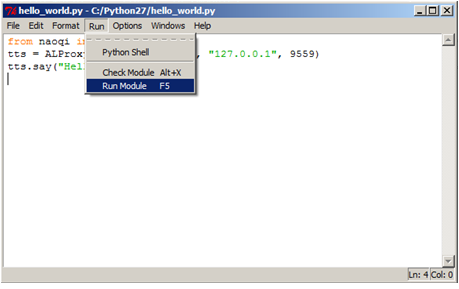 “Hello, world!” is the parameter. Create an object giving access to one of the NAOqi modules. Outside Choregraphe, IP and Port are mandatory parameters of proxy(). If you are not familiar with Python language, you should go through the tutorial included in Python distribution. To learn how to execute Python scripts on your computer or on your robot, see: Python SDK - Tutorials. To discover NAOqi API, its modules and methods, see: NAOqi APIs. Python is an interpreted language, so it is far slower than a compiled language like C++. If C++ has no secret for you, or if you strongly want to learn it, Install the C++ SDK. For further details, see: C++ SDK - Installation Guide.